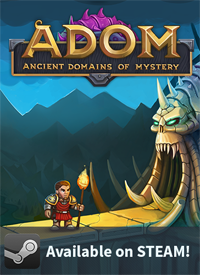 The Official Blog for ADOM (Ancient Domains Of Mystery): ADOM RPG Kickstarter now live! 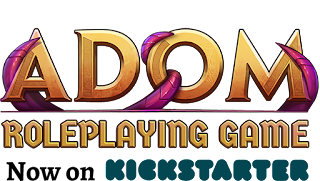 As planned our ADOM: The Roleplaying Game Kickstarter campaign went live minutes ago! Please support us, help reach the funding goal and spread the news - it's so hard to reach people and your help is highly appreciated! 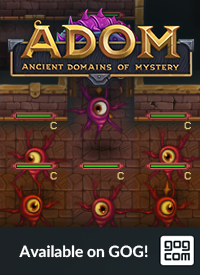 Why is this exciting news for ADOM? First of all it hopefully will help broadening the audience for ADOM in general. A wider audience always is good because it helps keep us going. Some of the design points from ADOM RPG will find their way into ADOM (not all of them, mind you, and more of them will make their way into Ultimate ADOM because for that we are completely re-examining all aspects of the current system). But there are interesting new parts like racial abilities that scale with increasing experience level (similar to class powers) or new ideas for class powers (so a pending revision of the existing class power system), many new corruption ideas and similar things that are very interesting for ADOM and thus eventually will find their way into ADOM. You finally can play ADOM face to face with other roleplayers. 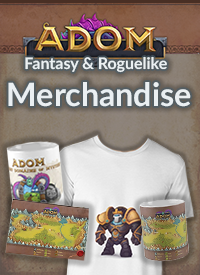 Additionally you in theory can affect the development of ADOM, Ultimate ADOM and the RPG in case you'd like to donate on one of the ultra-high levels - these will yield new factions and artifacts we design together with you. These factions and artifacts will make a direct appearance in Ultimate ADOM, in the ADOM RPG and (for the artifacts) also in ADOM. You can find samples for the ADOM RPG here. I really would like to donate, but I'm hesitant because of the wording of the stretch goals. Even though the 50 Euro Expert Adventurer tier allows print-at-cost of the full color hardcover books, I wouldn't get print-at-cost access to any of the stretch objectives unless I donate at the 100 Euro Dungeon Overlord tier? Why do I have to donate twice as much just for the "privilege" of being able to pay for my own copies of the supplements?